On March 19th, Intel announced the Intel® Optane™ SSD DC P4800X- the first SSD for the Data Center built using a new class of non-volatile memory called Intel® Optane™ technology. The Intel® DC P4800X SSD delivers an industry leading combination of low latency, ultra-endurance, high QoS and high throughput, making it the first SSD to combine the attributes of memory and storage. Does this combination of attributes in an SSD have applicability in the database world? Or more simply put- does using an Intel® Optane™ SSD in the following configurations have value? The use cases for the Intel® DC P4800X SSD are illustrated below. In a pair of blogs, I will explore both the fast storage and cache use cases and their applicability to a MySQL environment. In this blog I will explore the potential benefits of an Intel® Optane™ SSD as fast storage for housing databases. 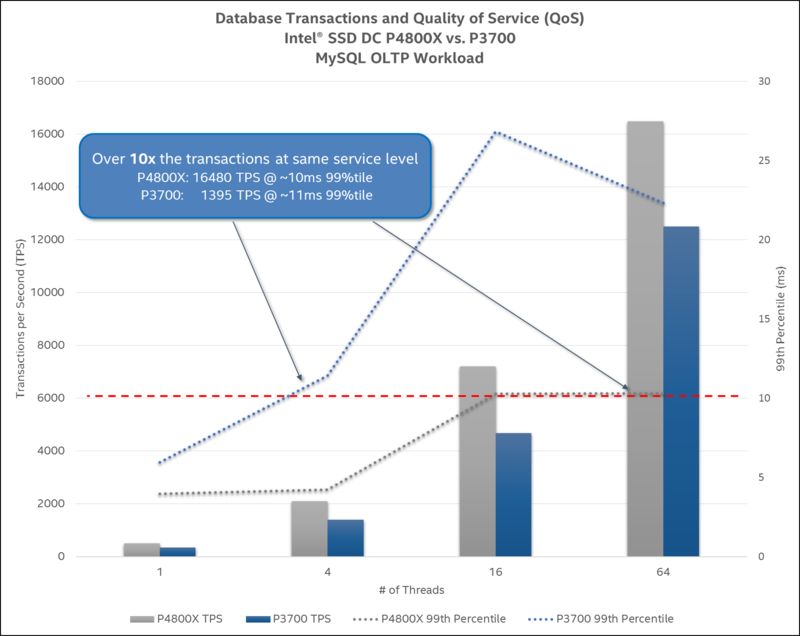 In a previous blog of mine entitled Does Database Performance Matter? (Spoiler alert: the answer is “Yes”), I looked at the effects that different classes of storage media have on database performance. Expanding on the testing performed in that blog, I decided to try a comparison between the fastest device in that blog, an Intel® SSD DC P3700, and an early prototype of an Intel® SSD DC P4800X. A sampling of transactions per second (TPS) and 99th percentile responses times were recorded while varying the number of threads created by SysBench in powers of 4 from 1 to 64. What stood out to me most wasn’t the advantage in the number of transactions that the Intel® SSD DC P4800X could support relative to the Intel® SSD DC P3700, but rather the Quality of Service (QoS) it provided as the number of threads increased. If one were to impose a Service Level Agreement (SLA) of a 10ms response time for 99% of all transactions, the Intel® SSD DC P3700 is already out of SLA at just 4 threads, while the Intel® SSD DC P4800X is still within SLA at 64 threads. Moreover, with both drives staying in (or close to) SLA, the Intel® SSD DC P4800X is performing over 10 times the amount of transactions. The Intel® SSD DC P4800X proved it has value in a MySQL environment where there is a high degree of concurrent users and/or where predictable performance is needed to meet an SLA. This is a “green field” design however. What if one is looking to take an existing configuration with an even larger database and accelerate it using an Intel® Optane™ SSD? I am going to explore that topic in my next blog: Applying Intel® Optane™ SSDs to MySQL- Part 2: Caching Device. Performance tests and ratings are measured using specific computer systems and/or components and reflect the approximate performance of Intel products as measured by those tests. Any difference in system hardware or software design or configuration may affect actual performance. Buyers should consult other sources of information to evaluate the performance of systems or components they are considering purchasing. For more information on performance tests and on the performance of Intel products, visit Intel Performance Benchmark Limitations. Tests document performance of components on a particular test, in specific systems. Differences in hardware, software, or configuration will affect actual performance. Consult other sources of information to evaluate performance as you consider your purchase. For more complete information about performance and benchmark results, visit www.intel.com/performance. Intel, the Intel logo, and Optane are trademarks of Intel Corporation in the U.S. and/or other countries. Copyright © 2017 Intel Corporation. All rights reserved.